No matter how much prior research you do before you venture out on your trip, there are always things you learn on the road. 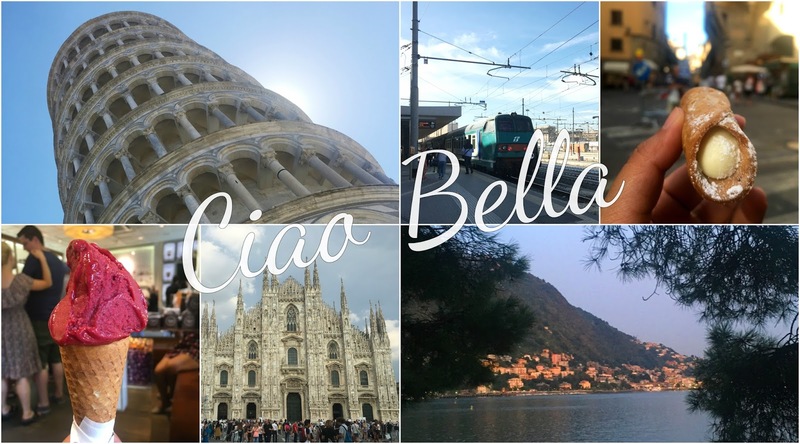 I just got back from Italy and I couldn't wait to pen down some real handy tips that you could make use of while planning your trip to this gorgeous country (you're welcome!). There's nothing like hearing about someone else's experience first hand traveling around a city and take back those tips to plan yours. And my hope is that these tips will make your journey planning and experience a tad smoother. Trains are such an easy way to commute between different cities in Italy. The cities are very well connected and the routes easy to figure out. The good news is you don't have to wait in long queues at the train station to buy your ticket; simply visit Trainline.eu and book your seat online. Also note, you don't need to print your train ticket; simply show it on your phone and the QR code will be scanned. Within cities, buses are a handy and economical mode to commute. One tip for you here - buy your bus ticket from a local grocery store for if you buy your ticket on the bus itself, it could cost you double the fare. Lastly, I always recommend plotting out a walking route on the map - exploring the city on foot is an unparalleled experience and you never know what you may come across. I was surprised that my pizza bill at a restaurant in Como came with a service charge. Not all restaurants charge that on your bill, or mention that on the menu. The explanation the waiter gave for the 2 euro service charge was to justify the 'effort of placing the cutlery and the table cloth for you'. True story. Keep your receipts and claim a tax refund at the airport. Oh also, you need to keep handy 80 cents to use the public toilets...the last you want is to be stuck with a 50 euro bill and no coins and really want to attend nature's call... not like it happened to me (#justsaying). It is a bit frustrating when hotel rooms are not fitted with universally adaptable charging points for your phone. After being on the road for a long time, your phone battery drains out and the last thing you want after you check into your room is to find that your charger does not fit into the plug point. In this really old hotel I stayed at in Florence, I was saved by the USB port in the TV. But in Pisa, I had no option when my power bank failed on me so I hopped over to the nearby supermarket and bought a universal travel charger. It's a life-saver. Invest in one. Before I left for Italy, I was warned and warned again to keep a close eye at all times on my bags. Rome and Florence are known for being the pickpocket capitals of the world, and nothing scared me more than losing my passport or cash. I would always store my passport and cash in the e-safe of my hotel room and then walk out to explore with cash only to suffice for the day. This way I could go sightseeing without being on paranoid mode. Here's a handy tip - don't buy the city map from the airports or tourist info kiosks. Your hotel will give you one for free and even recommend the best walking routes to maximize the most of your sightseeing time. They will also recommend the easiest or fastest way to get from point A to B, and anything else you need to know commute-wise. Tourist info kiosks do come in handy if despite using your map you find yourself off-route and would like to know your location. Here is also where you can find out about events happening in the city on the day and they can help make bookings as well. Sunday is a great day to be in Rome as the entry to key tourist spots such as the Colosseum and Castel Sant'Angelo are free - that also means you have to queue up for an hour sometimes to get in. Planning your trip in advance will also mean you benefit from less expensive hotel rates and entry spots into some of the most visited attractions such as Uffizi Gallery and Duomo in Florence for instance (you can't buy tickets to these attractions on the spot). Many Italians do not know how to speak in English. Have some Italian phrases handy to help you navigate the city. Where is.... How do I get to... Do you speak English... What street is this... I also recommend keeping hotel address written down somewhere so even if the person you ask for help doesn't understand English, they could read the address and help you out. I met a lovely gentleman in Florence who kindly walked me to the street where my hotel was after he read the address on my room reservation print out. He couldn't speak a word of English. August in Italy is a no-no. You may be tempted to soak in the Tuscan sun but in August the heat mugs everyone down and the locals set off for a holiday. This means many small shops, local restaurants, museums, walking and guided tours are also not operational. Despite this, you will still find August to be absolutely crowded with tourists. I was in Italy in the first week of September, and boy were Rome and Florence in particularly crowded! I find that creativity is at an all time high when you travel. In Italy, surrounded by beauty and art all around, ideas for my blog kept popping up in my mind, so I'd always dig out my little notebook and pen them down. I wrote some points for this particular post on the train from Como to Milan. This may seem like an obvious point for you. But if it is sunny in Rome in the summer months of August or September, you may be tempted to explore the city in your lightest dress, a hat (highly recommended) and your sunnies. In the evening however, it gets chilly, so carry a light cardigan and scarf. Italian cities have the best souvenirs you can buy - no, I don't mean just the fridge magnets or key chains. I bought dark artisan chocolate from in Milan, farfalle from Florence and Pinocchio marionettes from Pisa. Now you do need to account for these travel purchases when you are packing, so travel light from your departure point and bring back some edible and intangible memories. I maximized my time in each city by grabbing a bite on the go or using the snacking time to take a quick break from all the walking. I seldom stopped for a full meal which tends to usurp an hour; a whole precious hour that I could use for sightseeing. Rather I ate small bites at shorter intervals and that way tasted a variety of delicacies Italy had to offer. Marocchino and croissant for breakfast, a margarita slice to go for lunch, Sicilian cannoli stuffed with creamy ricotta for an evening snack, caffe-and hazelnut-flavored scoops of gelato for dinner - sounds like a dream doesn't it? Who needs a full blown meal when you're in Italy?